Like friends. Ones with large trucks to haul junk to the dump. And ones with vans and soon-to-be teens, happy to take oversized cushions and other sleepover-friendly things off our hands. We can’t thank you enough. Like John Bishop’s upside-down cake. Yes, a cake. 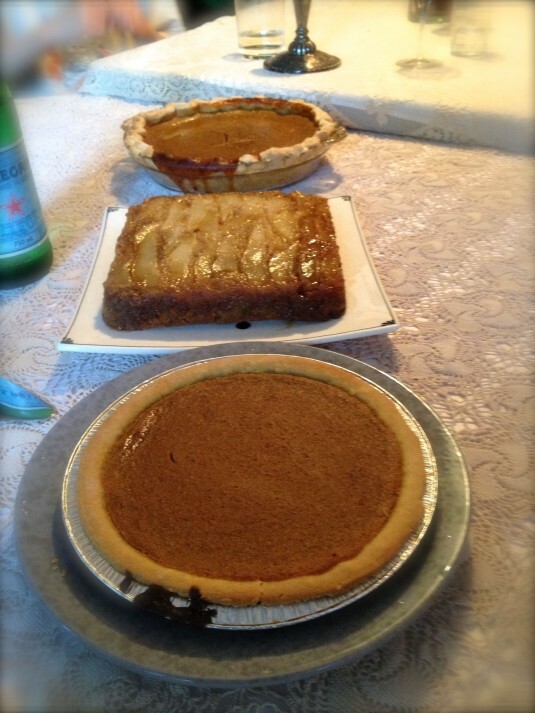 Eve, when you asked if I could bring a dessert for Thanksgiving dinner — even though moving day had been only a few days before, and I had countertops covered in stuff and a new oven to figure out — I knew baking something would help signal the end of this chaotic time. (Or at least the beginning of the end.) And I knew I could count on this cake to be delicious. I’ve made this upside-down cake several times, with different fruit, and I can attest to two things: 1) It’s dead simple to make, and 2) the results are consistently impressive. The ingredients are really quite ordinary, but its humbleness belies a surprising complexity. It’s moist, flavorful, with a toothsome crumb. The fruit is made sweeter and more delicious from mingling with the butter and brown sugar on the bottom of the pan. 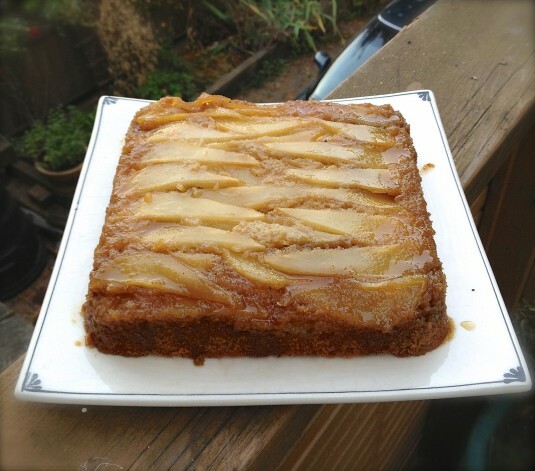 The pear ginger upside-down cake reminds me of a homey cake that Mom would have made from a community cookbook, on the rare occasion that she did any baking. She was more of a pumpkin pie eater, I bet she would have made room on her dessert plate for a slice of this cake too. Adapted from Simply Bishop's by John Bishop and Dennis Green, a book I highly recommend. 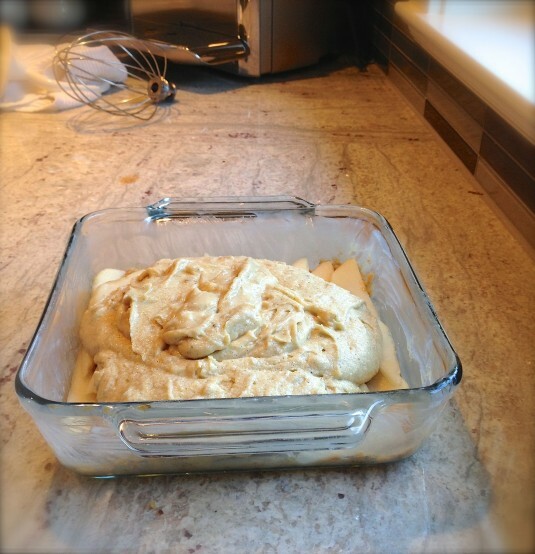 I've also had great results making this gluten free by substituting a gluten free flour mix. Slice the pears lengthwise about 1/4 inch thick. Brush an 8-inch square or round cake pan with melted butter and sprinkle with brown sugar. Cover the bottom of the cake pan with sliced pear. Sift together flour, baking powder, baking soda, salt and cardamom in a bowl, and set aside. Place softened butter and sugar in an electric mixer and beat until light and fluffy. Add eggs and mix until well combined. Add milk and mix until well combined. Add flour mixture and mix well. Stir in crystallized ginger. Pour the batter into the cake pan and bake for 45-50 minutes, or until a toothpick inserted into the center comes out clean. Remove from the oven and allow to cool for at least 10 minutes. Invert cake onto serving plate. While still warm, cut into slices and serve with whipped cream or vanilla ice cream.